After making some mochi dough with my food processor, I am not so afraid of working with the sticky mess of the mochi dough any more. 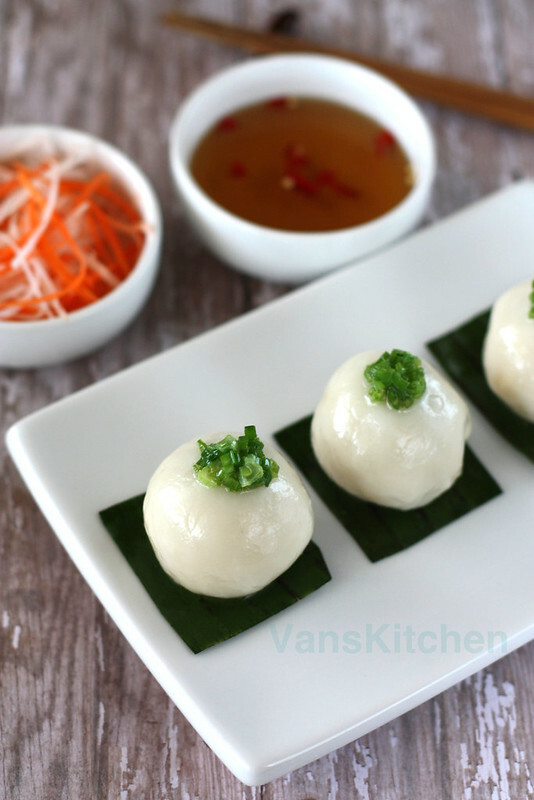 So, here are some savory sticky rice dumplings. 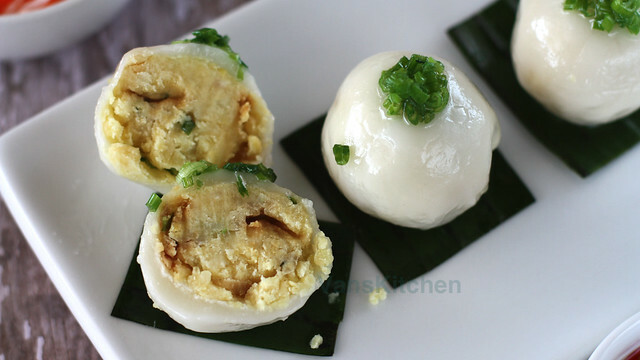 Banh it tran (literally, "the naked small cake"), is a bean-filled glutinous ball, served as an appetizer or part of a main course, or even as a snack. Dip them in a light fish sauce and serve with pickled carrot and daikon. They're so tasty and unique! Wash the mung bean, and rinse until the water is clear. Add water, and let the beans soak for 30 minutes. Then set the rice cooker to a “softer” setting, and start cooking. When the mung beans are cooked, transfer them into a bowl. Mash them finely into a puree while they're still hot. Add salt, deep fried shallot, and green onion. Mix well. 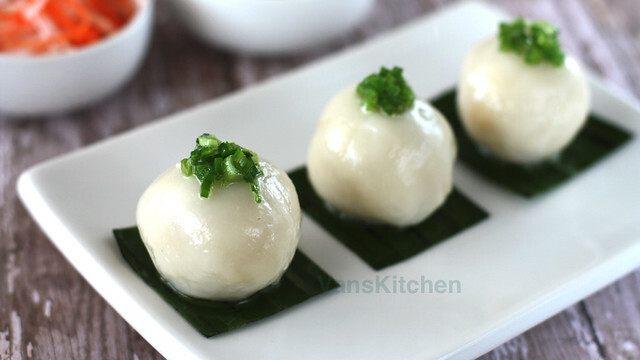 Using a small ice cream scoop, form the mashed mung beans into round balls. Repeat with the rest of the mung beans to make 8 balls. Pour hot water into a bowl along with oil. Place the mochi flour in a food processor. Add the hot liquid mixture in bit by bit. Run the food processor. Some flour crumbs will appear. Add more hot water mixture in bit by a bit. Process again.The dough at this point is kind of wet and sticky. Transfer into a bowl. Cover and let it rest 15~30 minutes. This gives the flour time to soak into the water, and become less sticky. Sprinkle a little bit of tapioca flour on the counter, and transfer the dough to the counter. Roll out the dough, and stretch into 8-inch-long strips. Cut the dough into 8 equal parts. Dust the rolling pin with tapioca flour, then flatten the mochi piece into a disc that is approximately twice as large as the mung bean ball. Place a mung bean ball in the center, and enclose with the entire filling. Don’t let any air in. Gently roll the dumpling between the palms of your hands until you have a smooth surface. Repeat with the rest of the ingredients. Always keep the dough covered so that it doesn’t get dry. Put a generous amount of water in a saucepan, and set over medium-high heat. When it starts to boil, drop the mochi balls in one by one. Give a stir so they don’t stick to the bottom. Cook until the balls float to the surface of the water. Leave them like that for a few minutes. Then transfer them into a bowl of cold tap water. Drain, and place on a greased banana leaf or a dish. Heat the oil, and when it starts to smoke, pour over the green onion bowl. Mix well. Place this green onion oil mixture on the mochi ball. Mix together the water and sugar until the sugar is dissolved, bring to a boil, then turn off the heat. Let it cool, then add the fish sauce. Before eating, add the chili. Pour the dressing on, then serve with pickled carrot and daikon.